The strongest and most efficient condensing boiler available. Accel CS is a quiet champion in an arena of lightweights. 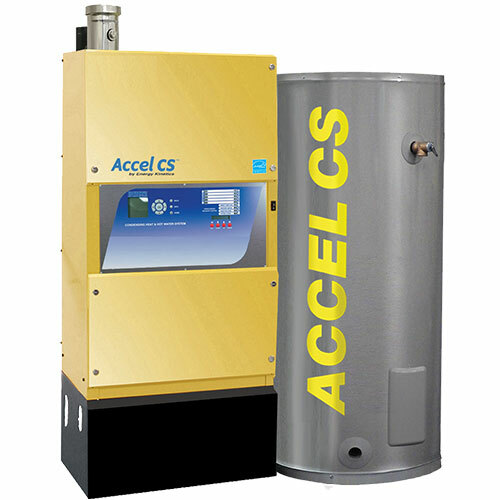 Accel CS is made with up to 5 times more stainless steel than virtually all other condensing boilers. Combined with exceptional engineering, the result is a higher efficiency, higher quality, longer life, outstanding made in USA product. Accel CS is the most efficient condensing boiler and is an integrated system, which means it produces both heat and hot water, the largest energy consumers in cold climate homes. The advanced design optimizes condensing operation and recovers more quickly from night setback temperatures. The result is lower fuel bills and comfortable warmth for living spaces, plus nearly endless hot water for showers, kitchen, bath, and laundry. Condensing technology is already established as a high-efficiency heating method. Accel CS takes it further, first with a better design and materials, and then by incorporating condensing technology in a combined system, a common sense marriage of processes that is simply smarter than any other condensing heating system. And you’ll enjoy benefits for years to come. The Accel CS design has wide open water and flue passes for long term reliability that surpasses small wall hung and combi boiler models with restrictive passages that can block up and burn out. Accel CS’s advanced condensing gas technology combines exceptionally low idle loss up to 97% AFUE for the best heat and hot water efficiency and performance. Other systems high idle loss is now known to cause annual efficiency to fall far from the AFUE rating and is virtually ignored by boiler manufacturers. Among many benefits, the Accel CS boiler runs more intelligently and adapts more swiftly to changing demands. As a result, the Accel CS boiler system delivers bigger fuel savings (greater efficiency) in every area of heat and hot water production. SmartBoost Comfort – Outdoor temperature reset can leave your home cold when recovering from an overnight setback or whenever you turn up your thermostat. Our SmartBoost technology automatically adjusts to make your home warm and comfortable faster. To prevent slow comfort recovery, contractors often increase the temperature reset curve on European style condensing boilers, but this permanently decreases the efficiency and savings. SmartBoost automatically adapts to demands and changing loads to boost comfort after first optimizing condensing operation and efficiency. Each cycle is optimized for higher comfort and lower fuel bills. Built-in Auto Express Setup, and no second pump is needed, improving efficiency over other condensing boilers. Energy Kinetics provides an exceptional residential lifetime limited warranty on the pressure vessel. Residential pressure vessels also offer a lifetime warranty transfer from the original owner to a new owner. The solid state Condensing Energy Manager carries a 5-year warranty and an extended protection plan for the life of your Accel CS. Refer to the specific warranty for details. The Accel CS condensing boiler system is easy to install and service and comes standard with a 5 zone control, including hot water and is expandable to 12 zones. Installations can be vented with polypropylene in a variety of chimney and sidewall configurations.